That’s right! Very soon Nintendo fans across the world will be challenged to ‘think like a snake’ by slithering, coiling and climbing across the once idyllic mountain of Haven Tor. Taking control of Noodle the Snake, accompanied by his hyperactive best buddy Doodle the Hummingbird, players will face snake-bending obstacles and perilous pitfalls in their quest to find and restore the Keystones that give Haven Tor its’ mythical power! 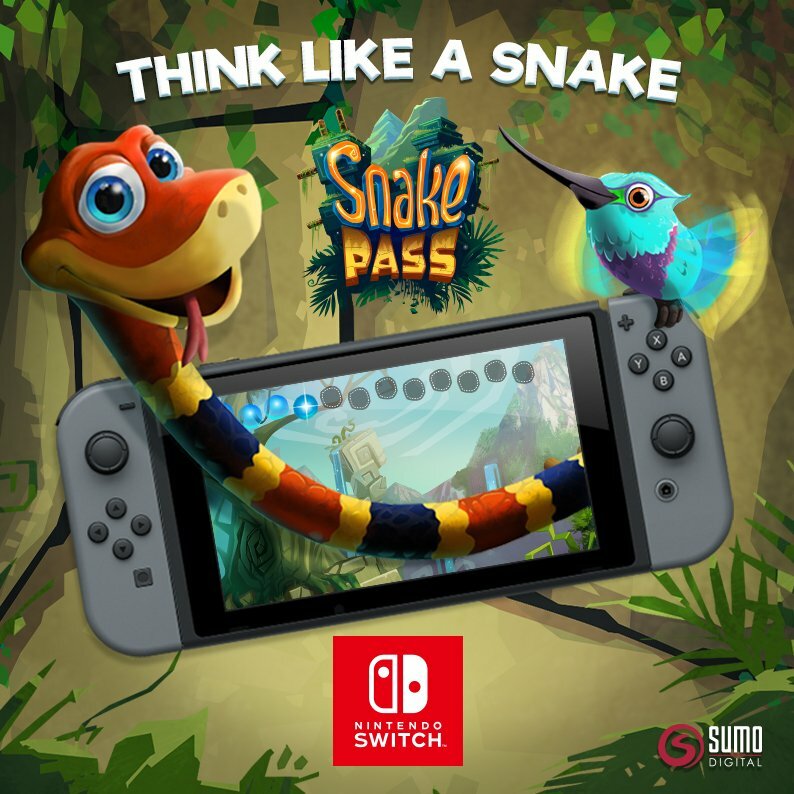 Whether you want to slither on the go in handheld mode, coil up in tabletop mode or climb into a comfy sofa and play in TV mode, Snake Pass on the Nintendo Switch is the perfect way to play, wherever you are! I couldn't find any mention of this game here and I thought it'd be something you all might be interested in. You can see some gameplay here. Just read that David Wise is doing the soundtrack for Snake Pass. Wicked! The article has some samples from the game. Great! I only knew about some rumors and a temporarily mention on the Steam page, but these samples are full of Wise's DNA. So happy that this game comes to Switch, too. I was always interested in it but not so keen on getting it on Steam. Awesome. Makes the game even more interesting. It's on my watch list. Holy cow, listened to the samples again. Suddenly, the game has so much more "soul" to it just with Wise's music! It really merges with the style of the game. David Wise... ahhhh!! The music clips are so lush and bright; they resonate on on an emotional level, so happy sounding ... adding "soul" to the project, as Reuckk puts it. I am so buying this for the Switch. Still hoping rumors of Mr. Wise's Nintendo project end up true. So apparently, it's coming to Switch on March 29th, yay! And it seems to only differ in having 30fps instead of 60fps on PS4, but I guess that's fine for such a "slow" game. So it's coming in two days - who's gonna get it? I'm certainly am - 20 bucks is a bargain! Just like Fast RMX a must-have for Switch owners (given the game is good, but David Wises music certainly will, so I'm buying it blind). Come on snake pass players, get in here! I personally bought this game on PS4, and I LOVE IT. I haven't gotten this much joy out of a 3D platformer in years. The game is very short all things considered, but it's so unique you won't care. A definate edition to any 3D collectathon lovers gaming collection. I keep seeing this game around and I will probably be tempted to pick up it -- after Yooka-Laylee. Last edited by Pgcrooner on Fri Mar 31, 2017 2:21 am, edited 1 time in total. Who's bought it? What's it like? I can't decide whether to buy it or not. Does moving around so sloely not get frustrating? Scrubber wrote: Who's bought it? What's it like? I can't decide whether to buy it or not. Does moving around so sloely not get frustrating? Didn't play it extensively, but from what I took, that's not the issue. Music and nice visuals / art style make up for that imo, but the main issue might be the core idea behind the game, it's controls. These can get frustrating at times, since there's no proper tutorial (Nintendo style) that builds upon things slowly, everything is thrown at you right at the start so you have to keep track of many buttons. Really liking this game and I love that they made a snake the good guy main character, and adorable to boot. For any fellow Australians interested in getting Snake Pass, it's currently on sale for half price in the Australian Nintendo eShop, until April 10th. Because I already bought the game months ago, the Nintendo eShop won't show me what the current price is (because it says "Purchased" where the price usually shows), but I got it last time it was 50% off and back then, that reduced it to $13 AUD. It might even be lower now if the game has gone down in price since I got it.